We are currently building a new website that is dedicated to the products we manufacture for the Tokarev and other platforms. Please visit theARguy.com for more info and updates! How do I order? Just send me an email to tim@thearguy.com Do not send money. All orders are placed in the que and when your order is ready and tested, I’ll call you and let you know its ready. We are now set up for credit cards . What are the different types of adapters? TMAL, TMAR, TMAF, and TMAB. From the picture above, the 3 center adapters are TMAR, Right side mag release; TMAF, flush mount adapter; TMAL, left side mag release. The TMAB is for our Blow Back users. Comming soon: M1CA for the M1 Carbine (among others). What are the metal clips on the back for? The metal clips are an optional method to keep the adapter held in the AR lower receiver. The adapters are held in place by the AR Mag Catch. Our testers commented that if they hit the AR Mag Release, they didn’t want the adapter dropping out. We came up with the optional mag lock so users can have an alternate way to secure the adapter without have to use an allen screw or something. Do I need to use the Optional Mag Lock? No you don’t, just unscrew the lock and use the adapter without it. That’s why we made it removable. Do I need to modify my Tokarev Mags? No you do not. 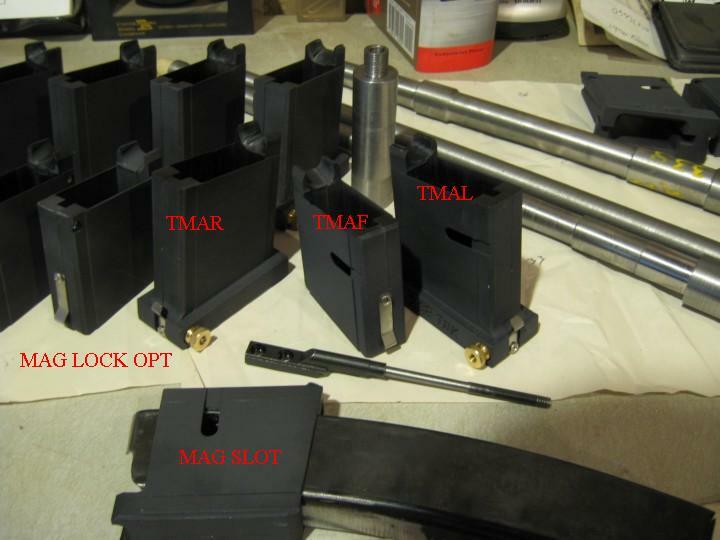 Our adapters us stock Pps 43 Tokarev mags. Now, having said that, the surplus mags are all over the place on tolerances. Our adapters take about 90% of the surplus mags right out of the wrapper. 5 – 10% are junk, and the rest can be tweaked to work. Check the left feed lip for interference with the carrier and overall front to back dimension. My Tokarev Mags won’t fit! We found a vary large range of sizes on surplus Tok Mags. We made a machining change to the adapter interior and now find that about 90% fit as is. If your mag does not fit please refer to our Mag Sizing instructions. We are finding that the Front to Back dimension is the majority of the fit issue. Lay the back of the mag on a block of wood, edged of a bench, or the open jaws of a large vise, and give the front a “tap” with a hammer. We have done this a number of times and it does work. If the mag fits but does not seat all the way, check the clearance with an empty mag and the bolt / carrier. Lock the bolt back, insert a mag, and release the carrier. Check the left feed lip of the mag. That’s where we find the majority of the interference. My Adapter won’t fit! Send it back and I’ll get you another one. Describe exactly where the adapter is interfering and what make and model of lower receiver you are using. Out of the lowers we used to test the adapters, we have a Colt Match Target Post Ban that is the tightest. We test all adapters in that lower prior to anodizing. Our Calvary Arms is the largest, by the way. Again, this is an area of tolerance vs function. We don’t have a lot of material to spare on the adapters and want them as large, especially side to side, as possible. If your mag won’t seat fully, pull the bolt/carrier back and check again. The feed ramps may be too high and hitting the carrier. Cycle the action and check for interference. We raised the ramps mid stream till they hit then dropped them back down a shade so there might be a couple out there with the high ramps. File them down or send it back and I’ll take care of it. What are some common feeding issues? #1 feeding issue is with other barrels and our adapters. The center lug on the barrel extension is not ground down enough causing feed issues. When the lug is properly ground, our adapters feed 100%. Another issue is related to the Tok Mag feed lips hitting the bolt or carrier. Check this clearance with an unloaded mag. Pull the carrier back and see how much clearance there is between the adapter feed ramp and the bolt, and the magazine feed lips and the bolt carrier. We tried to get the mag higher in the magwell as opposed to lower. We find that the left side magazine feed lip hits more often than anything else. We also find variation in the feed lip opening width. When we size a mag, we open this distance up to .500″, like on Uzi mags. The Tok mags hold the shells in a vary level position, as opposed to the Uzi mags which have a more inclined approach. We have tried mags both ways and the stock mags feed just as well as the ramped mags, but I tweak my feed lips anyway. Ground center lug: #35 = .7% FTF; #39 = 0% FTF; Rev1 = 4% FTF with unmodifed mags. 100% of the FTF were from one mag that the left feed lip was hitting the carrier. After the 4 FTF’s, there were no more. Thanks for the info S! How do you size a Tok Mag? Hopefully this is a thing of the past, we have done a lot of testing with mags right out of the wrapper with great success (other than the left feed lip hitting the carrier)…..The first thing we do is check for proper mag operation in a number of adapters and cull out the ones that do not drop free or lock into place. We measure these mags for reference. We then disassemble the mags for sizing and slotting. The first step is opening up the feed lips to .500″ in our lip jig and remove any sharp edges and burrs. The next step is to take the mags that don’t fit or are too tight to drop free and work on the offending areas. We find that 90% of the interference is because the actual radius of the mags vary. One of our customers took a small hammer and tapped the front of the mag and cured his interference problem and indeed, it works just fine. If we find too much material needs to be removed, we use that one to cut down for a 10 rounder. If the mag does not lock into place on the standard adapters, we check for clearance of the feed lips and bolt/carrier. This determines if we clearance the top or bottom of the large locking lug on the back of the mag. All cuts and edges are cleaned up and we touch up the blue, re-assemble, and test. Why don’t you use steel feed ramps on the adapters? We are looking into that as an option as well as other types of materials of construction. We use billet 6061 T651 aluminum for our adapters. The mechanical properties of this alloy and temper are not the highest or the lowest we could use. Our first prototypes were made out of plastic and they worked. We tried to be as cost effective as we could. 7075 aluminum is twice the price as 6061 and does not anodize as well. Is the adapter cast? No, we machine the adapters out of billet material. It costs more to do it this way, but the modifications that we have been making make it more cost effective at this time. Do you have spare parts? Yes, we have a complete line of spare parts for the adapters. We are working on packaging an Operation and Maintenance Manual for the adapters with all this info. Is the adapter Anodized? Yes. Our anodizing line is up and running! Will Tok Mags feed 9mm? Yes they will, to a point. We are using Tok mags in our 9mm DI upper and are working with field testing for use with modified adapters fitted with an ejector. The rounds have a lot of excess room, but they work. Do you offer blow back adapters and uppers? Yes we are. We shipped our first blow back adapters fitted with an ejector for use with Pps-43 mags and blow back operation. Is the surplus ammo corrosive? Yes, either because of the primers, powder, or both, in my understanding. Windex with ammonia D and two swabs of Hoppe’s #9 has been working for us. Does the corrosive ammo hurt regular steel? Of course it does, anything corrosive does, that’s why they call it corrosive. Shooting hurts your barrel too, stainless or CM. How you use and take care of your barrel will dictate how long it will “last”. How should I clean my rifle? I use Windex with ammonia D and Hoppe’s #9 after each session. Compared to shooting black powder, I would say the ammo I am using, Romainian, is about 25% as bad. I have left the barrel uncleaned for 2 days to track what happens and there was some formation in the barrel. Not near as much as some of the muzzle loaders I have worked on. Spray with windex and a patch or two then 2 swabs with #9 followed with an oil patch and there has been no signs of rust between sessions. It would also be a very good idea to clean out the gas tube, bolt, and carrier on the same regular basis. We have a small plating line that we may use to offer chrome lining, chrome bolts and carriers. but this is a ways off yet. Where can I get an upper? We are taking orders for uppers. Our uppers are Flat Tops in your choice of barrel length with Free Float Tubes and a std flash hider for $650. Do you sell just barrels and bolts? Yes, right now barrels are $235, gas blocks with tubes are $50, and bolts are $85. Are your barrels stainless? Yes, we are now offering Shilen Stainless barrels for $285 ea. What’s better CM or stainless? I do not have an answer for that. The stainless barrel seem “smoother” when I clean them. From a machining stand point, the stainless is softer than the CM. I think it is a personal choice. What is your Blaster Barrel? We are going to try these again, stay tuned………we just tried some new blanks and will try and make a run to see how it goes.